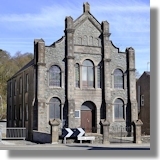 The first Baptist meeting place on Anglesey was founded in 1750 in Llangefni. Originally called Tŷ Cildwrn, it was a small domestic cottage on the road to out of Llangefni towards Holyhead, where worshippers met. In 1781 it was replaced with a purpose built chapel, renamed Capel Cildwrn. This small chapel was modified a couple of times in the early 1800s, but in 1846-49 it was enlarged by raising the roof of two thirds of the building to provide a more spacious interior, with a larger gallery. Further modifications took place in 1866 and 1878. At the end of the century the congregation decided to build a new larger chapel closer to the town centre, Capel Penuel. Capel Cildwrn was abandoned and disused for most of the 20th century until it was renovated in the 1980s and reopened for services as an Evangelical church. Their website contains a video greeting from the pastor that shows the interior. The year 1791 saw the arrival of Christmas Evans. Renowned for his powerful preaching style and vivid imagination, he is often considered one of the greatest preachers ever in Wales. Born on Christmas Day in 1766 near Llandysul, Ceredigion, he was the son of a shoemaker who died when Christmas was young. He grew up in hard circumstances, which included losing an eye in a fight. However, he was converted at a revival meeting when a teenager, and the previously illiterate young man taught himself to read so as to study the Bible. Evans soon moved on to preaching the gospel, and his talents began to be widely recognized. He was sent to North Wales and spent two years preaching on the Llŷn Peninsula. His reputation increased and he was asked to come to Anglesey to spread the Baptist cause there. His base was at Cildwrn, but he preached around the island and raised money for new chapels. 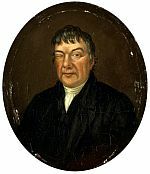 After the death of his wife in 1823, and growing disagreements with some sections of the now greatly enlarged Baptist Church of Anglesey, he decided to return to South Wales. He preached in Caerphilly and Cardiff for several years, but then returned to North Wales to preach in Caernarfon. He died in 1838, aged 72. June 2015 - Capel Cildwrn has been awarded £99,400 from the Heritage Lottery Fund for urgent repairs to its roof, fascias and chimney. By the 1890s the congregation were outgrowing Capel Cildwrn. It was decided (after some long discussions) to build a new, larger chapel closer to town. Evan Evans of Caernarfon was retained to draw up plans for a new chapel. It was opened in 1897 and was dedicated to their beloved preacher, Christmas Evans. In keeping with the monumental designs of late 19th century chapels, Penuel is in the Classical and Lombardic/Italian style, with entry through the gable end facing the road. A memorial to Christmas Evans can be found inside.